Now is the time to get outside and get some of earth’s free edibles! It is my philosophy that every meal made from nature is one less meal to buy at the grocery store. 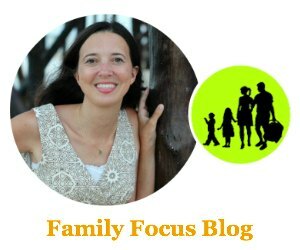 It is a way to carve away from the grocery bill, infuse nature’s nutritious and healing vitamins into our body and learn ways of becoming a little more independent (less dependent on the store-bought foods). I think groceries from the store are too expensive, not as tasty and often polluted with pesticides. So, I advocate early spring foraging of wild food and transferring these wild edibles into the landscape and gardens around a home. I will also share a fun foraging recipe with you that I just created. I think you will enjoy this beautiful and tasty Grape, Violet, Dandelion Salad Recipe. Yesterday, we went walking along a country road which runs through our neighborhood and foraged wild dandelion greens, a healthy choice they are very fun to gather in the fresh air of spring. The spring dandelions are young and tender right now, so they can be used in salads or cooked as greens. It is desirable to pick them early in spring, before buds appear on the plants but if you miss this window of time they still may be used if the leaves are still youngish. 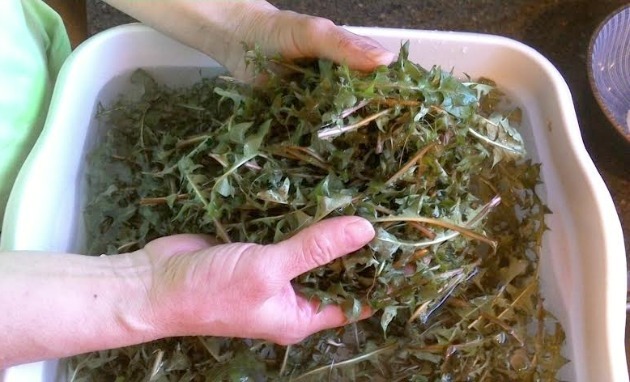 When harvesting if you cut off all the dandelion’s leaves, stems, buds, and flowers at the soil level the plant will re-grow and be almost as good as early spring leaves. They can be bitter, but there is an easy way to leach out the bitterness- you can soak them in salt water, as the French do. The health benefits of dandelion greens include anti-inflammatory properties, diuretic properties, and liver cleansing actions. Because the dandelion is high in potassium and antioxidant it is beneficial in the prevention of cancer and promoting healthy blood pressure. Because it contains copious amounts of Vitamin C, Vitamin K and Calcium it is an excellent natural antidote for osteoporosis. The little dandelion is one of God’s great treasure stores for the healing of modern ills. While we were foraging for dandelion greens, we came across some purple wild violets. 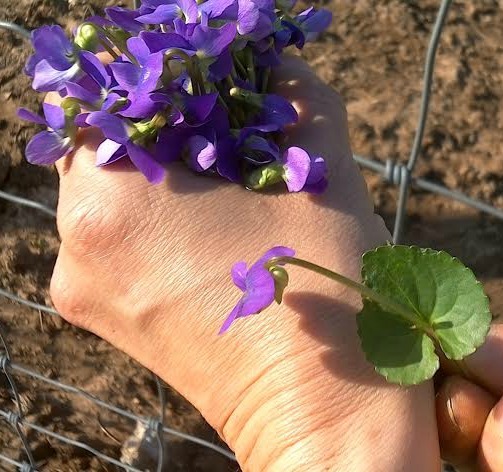 The purple wild violets are very edible and add a decorative touch to your salads! Both the flower and the leaf can be eaten. Please visit the link above for more pictures of wild violets and to learn more about them if you are unsure if you have wild violets. I gathered a bunch of the violets to add to our dandelion salad for color and for a natural dose of vitamins A and C.
Prepare the dandelion greens by cleaning them, then soak them in a basin of water with about 1/8 to 1/4 of salt in the water. Soak for about an hour, this removes bitterness. Cut grapes in half. Peel and cut the apples. Rinse the violets. Whip up some balsamic vinaigrette dressing. Half salad oil, half balsamic vinegar, minced garlic, herbs, salt and pepper to taste. Toss the greens and fruit in the dressing. Top with sunflower seeds. Decorate with the violets. Voila, delish and nutritious Grape, Violet, Dandelion Salad Recipe! While you are out gathering the dandelions, why not grab a few of the “puff balls”? Those are seeds. When you get home sprinkle them into a flower bed and encourage this wild edible to grow in a patch near your house. They grow best in flowerbeds where the taproots can grow deep and produce bigger leaves. God’s hidden treasures, are often times thrown aside and wasted, being dismissed as “weeds.” Resurrect the vitamins and life-giving health of nature’s bounty! Also, you can collect a large amount of the dandelion greens, blanch them for one minute in boiling water, let them cool and then put them in freezer bags to store in your freezer so that you can use them as a cooked green anytime! Have you tried early spring foraging before? What are your favorite wild foods? Do you think you will try this Grape, Violet, Dandelion Salad Recipe? Let me know what you think if you do! If you enjoy wild edibles, you may also like to learn about what mayapples are or try this wild polk salad recipe (caution- poisonous when raw).